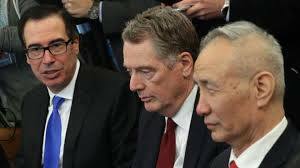 U.S. Treasury Secretary Steven Mnuchin said that U.S.-China trade talks continue to make progress and that the two sides have basically settled on a mechanism to enforce any agreement, including the setting up of new enforcement offices. “We’ve pretty much agreed on an enforcement mechanism; we’ve agreed that both sides will establish enforcement offices that will deal with the ongoing matters,” Mnuchin said, adding that there were still important issues to be addressed. But Zhang Zhexin, a U.S. Affairs Expert at the Shanghai Institute for International Studies, said the offices would not be able to prevent the U.S. imposing unilateral sanctions against China, nor would they be able to minimize strategic competition between the two states. “But they will at least provide a standing and regular platform for settling future disputes in a constructive, responsible and bilateral platform,” he said. Mnuchin declined to comment on when or if U.S. tariffs on USD250 billion worth of Chinese goods would be removed. He also refused to put a time frame on the negotiations, adding that Trump was focused on getting the “right deal”. In what could become a new front for disputes between the two countries, the U.S. Commerce Department included 37 Chinese companies and schools on a list of “unverified” entities that U.S. companies need to treat with caution. Though different from an embargo, the move could still have a major impact on entities on the list as U.S. companies tend to avoid potential hassles. Commenting on the U.S. move, Chinese Ministry of Commerce Spokesman Gao Feng said that the listing would hurt Chinese firms’ reputation and hinder their normal trade activities. “China called on the U.S. to rectify its mistake by following the principle of mutual trust and mutual benefit,” Gao said. In some cases, U.S. companies would need to obtain fresh licenses to supply products they had previously sold to companies on the list. The U.S. Commerce Department warned that it could not verify that the organizations in question are abiding by export administration regulations. A 32-page report added a total of 50 bodies to the list, including six Hong Kong firms. Educational institutes affected included the Changchun Institute of Applied Chemistry, Guangdong University of Technology, Renmin University in Beijing and Tongji University in Shanghai. U.S. President Donald Trump hinted that the trade war with China could be ended in a four-week time frame, but China’s Global Times newspaper urged patience “as neither side has made any promise that there will definitely be a deal”. “The fruit is not yet ripe, and if either side makes a hasty move to pick it, that side may have to pay an extra price or it may have to force the other side to pay an extra price,” an editorial in the newspaper said last week. “It will incur serious problems down the road and weaken the deal’s ripeness and fairness,” the newspaper continued. “The U.S. side has sometimes been upbeat, giving the impression that a deal is almost there. But sometimes it has stressed the differences and difficulties. The Chinese side has basically refrained from making a prediction of the final result. At this moment, patience is probably the most important thing.” China and U.S. have entered what has been described as the final stage of intensive talks to reach a deal, but an agreement might still not be reached by the end of the month. According to the editorial, the two sides first need to resolve their differences over the text of the agreement, and the remaining issues are seen as the most difficult to resolve. Both sides should also reduce bilateral “political and security frictions” so that there will be sufficient political and public goodwill to reach a trade deal. They also should treat a trade deal as a step towards better bilateral relations in general,” the editorial concluded. Last week both negotiating teams continued their talks through teleconferencing. U.S. and Chinese negotiators are discussing adding a concession on cloud computing to their trade agreement that would give foreign companies greater access to the USD12 billion Chinese market, people familiar with the talks said. Chinese officials called a meeting last week with representatives of companies including Microsoft, Apple and Amazon.com to talk about the proposal in detail. The discussions include possibly scrapping the requirement that providers of remote computing services form joint ventures with local companies. Foreign cloud companies are required to license their technology to local partners to operate in China and have been forced to store some information within the country. In 2017, Apple agreed to shift storage of data for Chinese users of Apple’s iCloud services to server farms operated by Guizhou Cloud Big Data, a company with local government ties. Amazon also agreed to sell some of its Chinese cloud assets to its local partner to comply with government regulations.